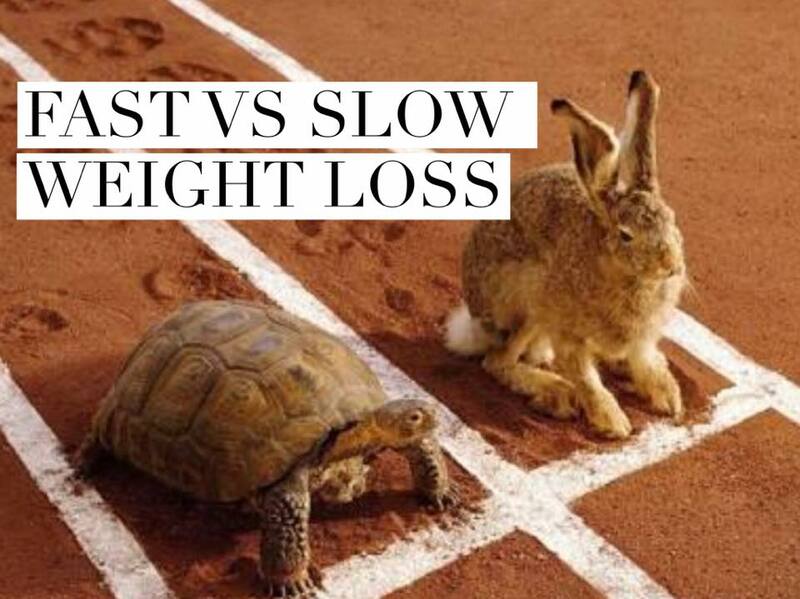 ChrissTinslay.com > Blog > Uncategorized > Which is better, Fast or Slow weight loss? You might be surprised. Which is better, Fast or Slow weight loss? You might be surprised. I know you have heard a million times that slow weight loss is better and healthier than fast weight loss and that you have much more chance of maintaining if you take the slow and steady approach. But, just because you’ve heard something a million times, doesn’t make it true. In fact research says that faster initial weight loss has advantages over slow. I believe neither there are pros and cons for both. As always you should become the expert on yourself and do what works for you. ** With the caveat that you do it in a way that provides adequate protein to preserve lean muscle mass. No BS 💩 detox cleanses, starvation, juice diets or similar. Sometimes when your aim is a small deficit each day, it can easily get canceled out with a few extra mouthfuls here and there. ✔️ the body does not like being in a deficit. The sooner you can go back to a calorie balance, where the body is happy. However please know, if you go back to your old ways (ie – calorie surplus), you will regain the lost weight. What you do after the after is perhaps the most important part. By the time you have reached your goal weight you will have had lots of time “practicing” your new healthy habits. This can make them easier to continue. Fit into your regular lifestyle with less disruption . Sally wants to lose 10 kgs. In other words 75kg Sally wants to be 65kg Sally. For this to happen, Sally needs to consume less calories each day. Yes, you read that correctly. Approx. 300 calories = a 10kg difference. Makes you think twice about “a little bit extra wont hurt” doesn’t it”? Ie – start as she plans to continue and consume 1600 calories each day. This will give Sally slow, incremental weight losses each week, that eventually will result in her goal weight. This will get her to goal weight faster, then she can increase to the necessary 1600 calorie intake, in order to MAINTAIN her new 65kg weight. **Sally could possibly lose 10kgs in 8 weeks if she also increases the amount of calories she burns each day by moving / exercising more. Either way, once she reaches her goal weight, Sally will need to stick with daily habits and actions that result in the lower 1600 calorie intake in order to maintain her new lower weight forever. ^^^This is the part that some people don’t seem to grasp. They go on a “diet” to achieve a goal. Then, believing the job is done, they resume to their old ways, which in turn = their old weight. Seems so obvious, but I see this play out time and time again. Which way do I personally prefer? I get my fat loss coaching clients to start with a turbo boost kick-start protocol whilst they are A) highly motivated and B) in the most discomfort at their present weight and shape. This gives them a quick win and takes some pressure off. We then move into a slow and steady approach in order to “practice” the habits they will need to continue on forever. Would like more help with your fitness and weight loss goals? Check out how fat loss expert Chriss Tinslay can coach you..